I can’t believe I’ve been in Europe for a month already! Time has been going by so quickly and I have been having a blast! I can’t get over how different this semester feels then when I was here in the winter. I spent much of January feeling very lonely and my biggest priorities were to meet new people and to experience as many London sights as I could. This semester, I’m less concerned with doing touristy things in London and I really just want to experience living here. I’ve been getting on really well with my flatmates and I’ve really been enjoying catching up with all my friends. I feel very comfortable and at home in London and I really couldn’t be any more excited to be back! Last weekend Rocky came to visit and I spent a nice night out with him, Alex, and J. We went to a Belgian restaurant and I had the biggest serving of mussels and fries ever! 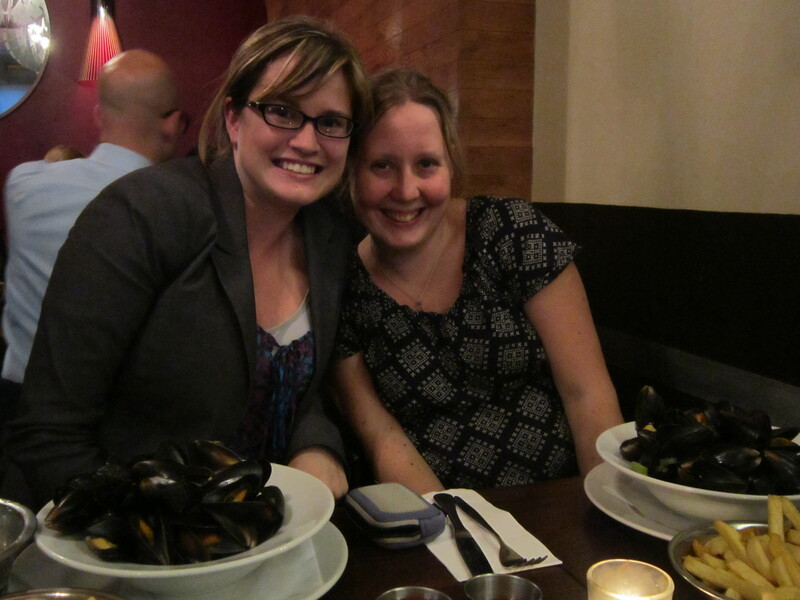 It was ‘beat the clock’, so for £6.15 (we ordered at 6:15), I got a half kilo of mussels! We met up with a few of Alex’s friends after that and Rocky introduced us all to the crazy world of bubble tea. If you haven’t heard of it, it’s a fruity drink with little tapioca balls in it. Rocky loves it, but I think it is the strangest thing ever! 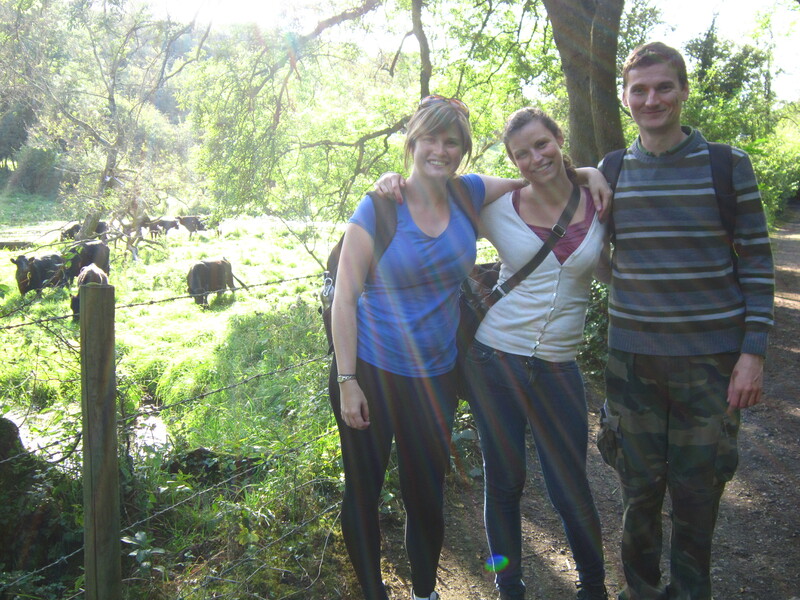 Last Saturday I got up early to go on a mini-trip with 3 of my flatmates. We took the train west for an hour until we came to a small village called Cirencester (pronounced Siren-cester). It was a beautiful day, so we spent some time exploring the village, which was comprised mostly of old stone buildings. We spent some time walking through the park and we visited both the cathedral and the farmer’s market, where we had some delicious cake and fudge! We also stopped at an old Roman amphitheater just outside the city. It was pretty ancient and you could no longer see any of the stone, just oddly shaped hills that had grown up around the amphitheater. We spent the rest of the day hiking through the countryside. It was exactly how I pictured hiking rural England and it was incredibly nice. 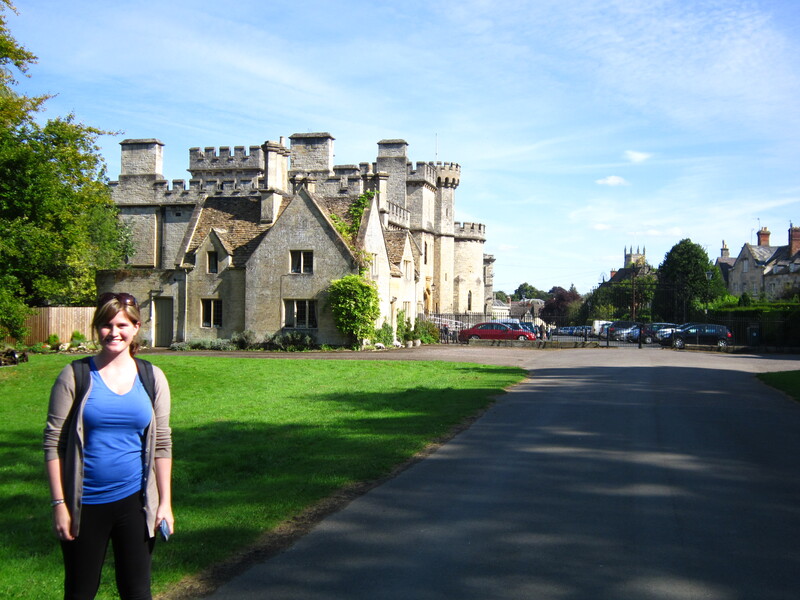 We walked for about 5 miles through Cirencester Park, which is all fields and trees, until we came to a small village. From there we hiked another 5 miles along the river, which took us through lots of small towns. There was lots of wildlife around and we managed to see a wild deer and a rabbit (along with lots of sheep and cattle). All in all, we hiked about 15km and finished off with a nice meal in a local pub before heading back to London. On Sunday, Melanie came out to visit me from Harlow, where she is doing her teaching internship. She came to church with me at Regent Hall (known as the Rink from here on in), where I made my singing debut! I joined the worship team for the semester, which I am excited about, and I had my first performance this past weekend. We spent the afternoon at my favourite market, Spitalfields. Unfortunately it rained on us, but we made the best of it! This week I’ve really been getting into the groove of things. I’ve started swimming again and I’ve been taking a course by distance that I’ve been working on. I also had a lovely dinner to catch up with my friend Camille. 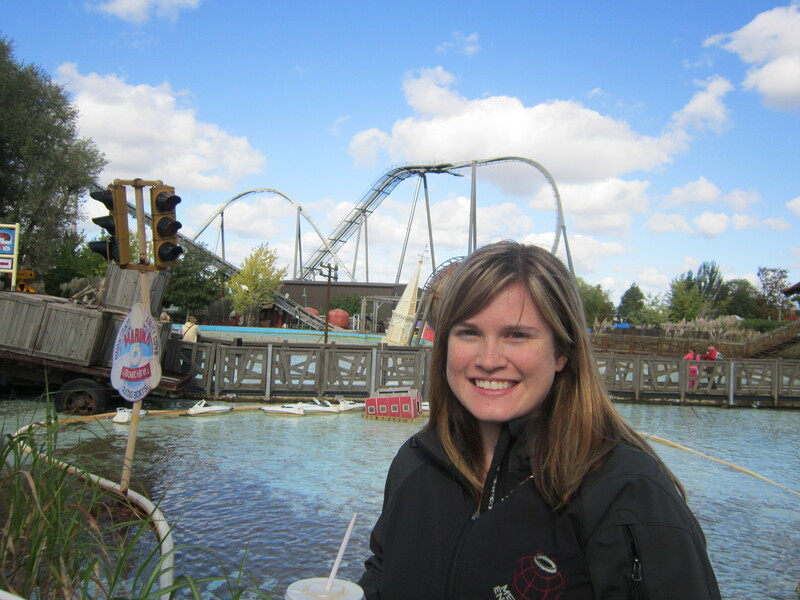 I spent Saturday at Thorpe Park with my colleague, Kiran. It’s an amusement park about 45 minutes outside of London. It was much better than I thought it would be and I had a great time going on rides and roller coasters! The best one was easily this roller coaster called The Swarm. The premise of the ride is that an alien swarm has attacked earth; I’ve got to give the park props for putting a lot of time into making the ride as realistic as possible. The roller coaster is surrounded by burnt-out vehicles, fire trucks, ambulances, and even a crashed plane! To conclude this blog, I really have been having a wonderful time and I’m excited for all the things I’ve yet to experience while I’m here! As always, I still miss everyone at home and I would love to hear from you guys! Steph and Suyen, I promise you both skype calls very soon!! !